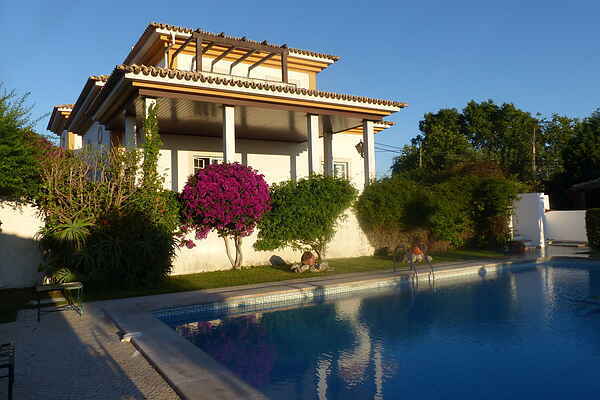 This comfortable villa is in a perfect location, on the edge of the seaside resort of Sesimbra. Your private swimming pool offers views of the Arrábida Natural Park. There's a beautifully landscaped garden and of course a wonderful terrace with a BBQ. This villa is spacious and equipped with all modern comforts - there's even a billiards table! The villa is situated on a quiet peninsula, south of Lisbon. The nearby Arrábida Natural Park is easy to get to and perfect for nice walks and magnificent views of the Atlantic Ocean. Don't forget to spend a day (or two) in famous Lisbon (40 km). On your way there, you'll pass Almada; this is where you'll find the Christ the King statue (overlooking the river Tagus and the city of Lisbon) as well as some historical monuments such as a war ship from 1845. Once you've arrived in Lisbon, you can visit the Oceanarium, the Dos Jéronimos Monastery and take a trip on the river Tagus. There are plenty more things to do in the vicinity; there's an attractive market with fresh produce in Sétubal and both Setúbal (25 km) and Sesimbra (4 km) are nice places to relax on the beach.